Sustainable development became a major driver of technological and social innovation in 1983, shortly after the release of the report from the World Commission on Environment and Development; what later became known as the Brundtland Commission. Following recognition of the societal imperative to preserve resources and the environment, and the challenges associated with poverty and other social injustice, researchers began to embrace these concerns and seek solutions. Technological solutions were developed to address many of the environmental issues associated with clean air, drinking water, and the production of energy from non-fossil resources. Economic analyses were developed to internalize the true costs of environmental harm. But solutions for social challenges continued to lag. Even with the identification of the triple bottom line as a corporate imperative, business continued to develop new technologies that consumed non-renewable resources at an alarming rate, fossil resources were consumed producing CO2 and other global warming gases, and the use of critical materials (i.e. minerals that are in low supply but essential for modern electronics and other essential services), remained the norm. What remained missing throughout the equation of sustainable development were new and holistic techniques for the education of the next generation of business and technology leaders. Individual faculty in isolated locations made heroic efforts to engage students in these important topics, but such efforts frequently would only reach those individuals who were already inclined to create a more sustainable world. As a whole, colleges and universities, especially those outside of Europe, largely carried on with their curriculum, without the pointed attention that this growing challenge deserved. Fortunately, many of today’s educators have recognized the challenges of sustainable development, and the holistic approach that is needed for students to properly address these challenges. Universities throughout the world are developing new curricular elements that integrate sustainability challenges throughout their coursework. And perhaps more importantly, university leaders are adopting sustainability principles and embedding them into the operating procedures that make up the fabric of the modern university. This new work looks at several initiatives underway at universities to provide a view of some of the ways in which issues of sustainable development are now being considered on college campuses. It brings together various efforts across a range of opportunities; from under-graduate and graduate courses to the development of a university sustainability office; that provides the reader an opportunity to consider what has worked elsewhere and how it can possibly be adapted for application on one’s own campus. One of our great challenges as educators is to do more than simply instruct our students on how they should behave. Rather, it is to adjust our attitudes to behave in the manner that we would like our students to emulate. To teach by example, and thus to show with our deeds the important lessons that our students must internalize. In this way, we can impact the future and make our world a better place for the generations that will come after us. Fundamentally, that is the point of sustainability; to ensure that our children, and their children, have the opportunity for a life well-lived on a healthy planet. Through the lessons included within this book, we move closer to that ideal. The idea of this book originated from a Sustainability conference at The University of Toledo on Nov. 1, 2012 organized by Dr. Kumar. The conference has been a focal point of students-initiated activities and colleges’ efforts to promote sustainability on campuses in Northwest Ohio. Students, faculty, staff, and administrators gathered together to share their experiences and discuss the lessons learnt and future directions to achieve sustainable campuses and communities. Since the release of its definition by the World Commission on Environment and Development (Burndtland Commission), “Sustainability” has been a buzz word in every aspect of our lives. The “Sustainable Development” concept is regarded as one of the most successful approaches to support strong economic and social development. However, despite its popularity, it is not clearly understood by many ordinary citizens due to its broad and rather vaguely defined concept. Many people regard that practicing sustainability should be government-driven and industry-oriented business, something that they don’t know (or don’t care) except for putting an empty aluminum can in a recycle bin. Environmental pollution has emerged as a serious problem in the past few decades. The increasing population has further burdened our environmental resources and intensified the already existing problems. Industrial processes, power generation and transformation, and various other demands of a modern lifestyle have resulted in production of many chemicals and their byproducts that deteriorate the quality of air, water, and soil. With the growing concern about the environment, sustainability issues are being prioritized for comprehensive development. Development and maintenance of a sustainable environment is one of the major challenges that mankind is facing today. One should always consider a sustainable alternative under all circumstances, so that the limited amounts of natural resources can meet the requirements of the ever-increasing population. Sustainable Development stands for meeting the needs of present generations without jeopardizing the ability of future generations to meet their own needs. In other words, it stands for a better quality of life for everyone, now and for generations to come. It offers a vision of progress that integrates immediate and longer-term objectives, local and global action. It also regards social, economic and environmental issues as inseparable and interdependent components of human progress. Although taken as a critical issue, sustainable development has been actually practiced in limited areas. Conceptual understanding on sustainable development is either too specific to certain fields, too broad in others, or even incorrect in still many other fields. Most research on sustainable development has been focused on technical approaches to alternative energy development and its impacts. This book contains practical and hands-on examples of sustainable practice, and sustainability education happening on college campuses. This book is a showcase for many ideas and endeavors pursued on college campuses. Through the case studies presented in this book, the concept of sustainable development can be more clearly understood. From a textbook approach to a “crazy” idea, campus activities for sustainable development are an effective way of learning and implementing sustainability in surrounding communities and industry. A college campus would be the best place to practice and test new ideas and to learn valuable lessons from the results and mistakes. The case studies include past, current and projected activities to green college campuses. In addition, the pedagogical challenges in sustainability education are included to address the key issues of the multi-disciplinary nature of sustainability, useful tools, and lessons learnt. Most of the book chapters have been selected based on the concept and depth of presentations given at the conference. We also invited outside authors who are working in the similar areas to elaborate the topics. 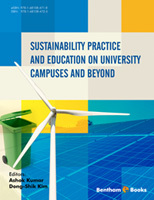 The additional chapters are believed to help the readers see similarities and differences between campus and off-campus practices, which reinforce readers’ insights on sustainability practice. It also helps the readers understand how the campus practices be extended to communities, industries, and governments. For example, case studies by professionals who apply and practice sustainability for military bases and governments provided deeper insights and comparisons with the campus practice and broadened possible applications. All the selected authors prepared their book chapters according to editors’ guidelines. They described the contents in detail, included the literature review and added any new material and future direction on their case studies. The topics in each chapter have been extended to global perspectives in order to help readers apply the campus practices to various levels and areas. Each book chapter was reviewed by one of the editors and/or an invited reviewer who is an expert in the related field. First four chapters address past, current and projected activities to promote sustainability and to green our campuses. Success stories, pitfalls, and opportunities are shared. These four chapters cover the development of a sustainability office, recycling program, waste reduction program, and LEED certification for universities and colleges. Next four chapters include the information derived from students’ projects and homework assignments involving university education, teaching life cycle assessment, design of a solar power system, and role of a field station. Furthermore as the multi-disciplinary nature of sustainability presents pedagogical challenges, the key issues that should be discussed in class to overcome these challenges are presented in these chapters. The primary audience of this book are college students, faculty and sustainability-related researchers. It will be a good source for high school students and teachers as well to get a better understanding on the concept of sustainability and what can be done on campus and community. Decision makers in governments and industries may use this book as a resource to get possible ideas for promoting sustainable development. This book may be of interest to environmental administrators and facility managers in charge of environment who want to install new plans and investigate potential impacts and pitfalls.